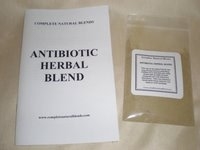 Herbal antibiotics will aid in building immune reserves, and immune deficiency optimizing health and the quality of life. Certain herbs are effective against drug-resistant bacteria. They have very strong immune activating abilities as they activate the white blood cells to fight off both bacterial and viral infections. They also activate the body's production of interferon, a specific protein which protects cells against the invasion of viruses. The immune system protects against bacteria, viruses, toxins, parasites and microbes. It is extremely important to maintain a healthy immune system. A poor immune system is more susceptible to infections, colds and flu, cancer, and heart disease. Bacteria lives all around and hundreds of beneficial bacteria live in the human body helping to protect against harmful ones. Prescription antibiotics are effective in killing bad bacteria, but they also kill good bacteria. Good bacteria is an important part of the immune system, lining the digestive, respiratory, and urinary tracts. Prescription antibiotic use will often cause yeast overgrowth, which further weakens the immune system. The continued use of prescription antibiotics is a major contributing factor to chronic health conditions. Prescription antibiotics tend to suppress the immune system and cause the immune system to attack the body's healthy organs and tissues. Antibiotic resistance occurs when the antibiotic is effective in killing some of the bacteria, but the ones that survive breed more of this stronger type and mutate to become resistant to the antibiotic. Prescription antibiotic use can also lead non-disease causing bacteria to mutate into more harmful strains and become disease causing. A vicious cycle is created of taking prescription antibiotics and breeding new and more resistant strains of bacteria while the immune system becomes increasingly degraded.